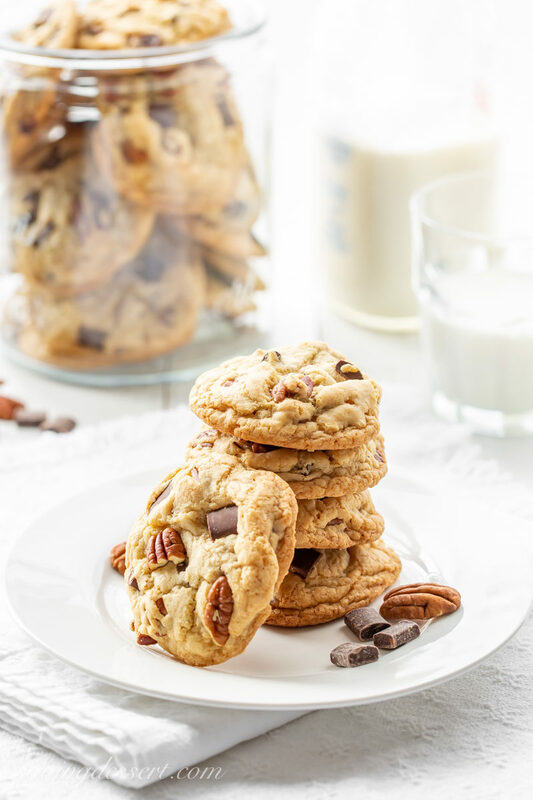 Thick and Chewy Chocolate Chunk Cookies with toasted pecans are our new favorite cookie recipe! These delicious jumbo-sized cookies rival any you might find in a gourmet bake shop! Do you ever gaze at the pastry shop window and wish your cookies turned out thick, chunky and chewy like the ones on display? 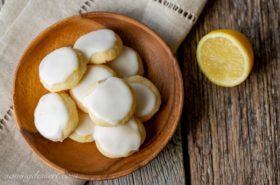 Now you can make them at home, and they taste even better than the ones that cost over $2.00 a pop! These cookies are loaded with everything we love in a great chocolate chip cookie. Big chunks of semisweet chocolate and toasted pecans all wrapped up in a buttery dough with the perfect balance of brown sugar and vanilla. Is it possible to have too many chocolate chunk cookie recipes in the world? I think not! Chocolate Chunk Cookies are obviously not a new breakthrough recipe for sure. They’ve been around for ages and ages, i.e. forever. Many bakers reminisce about how chocolate chip cookies were the first things they ever baked on their own. I know they were for me at the age of 10! My family preferred chocolate chips cookies made with light brown sugar instead of dark, and usually without the nuts. 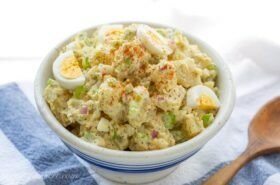 Nobody seemed to mind when I occasionally made a batch or two after school, and more frequently during the summer months. I remember using the Original NESTLÉ Toll House Chocolate Chip Cookies recipe and loved how the spoonfuls of dough spread into a thin chewy cookie. What a delicious treat with all that melted chocolate, crispy edges and chewy middle. Food memories = LOVE! While those thin yummy cookies from my childhood are tucked away in the corner of my heart, now days I prefer a thicker cookie with plenty of chew factor. 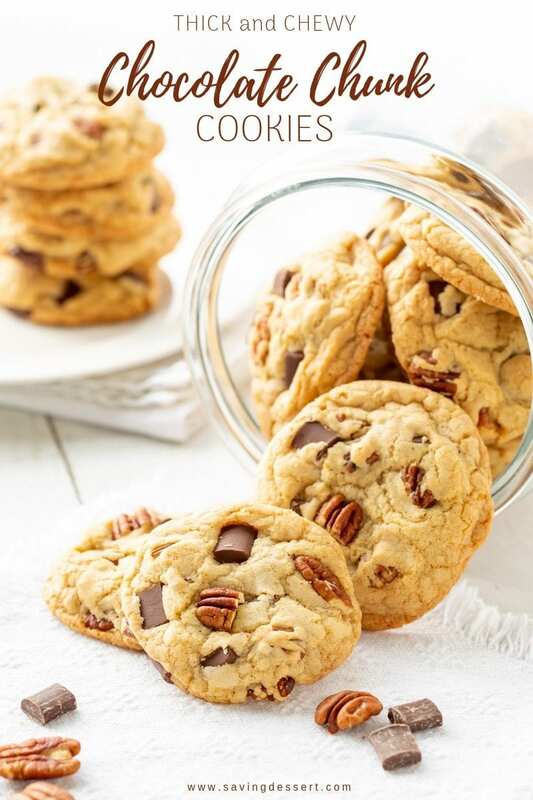 From the big chunks of chocolate to the toasted pecans, these are terrific cookies you can really sink your teeth into. Store the cookies at room temperature in a sealed container. Don’t forget to add a slice of bread to the cookie box to help them retain their perfect texture. They should keep for up to 5 days but I don’t think you need to worry about how long they’ll last, they don’t last long! 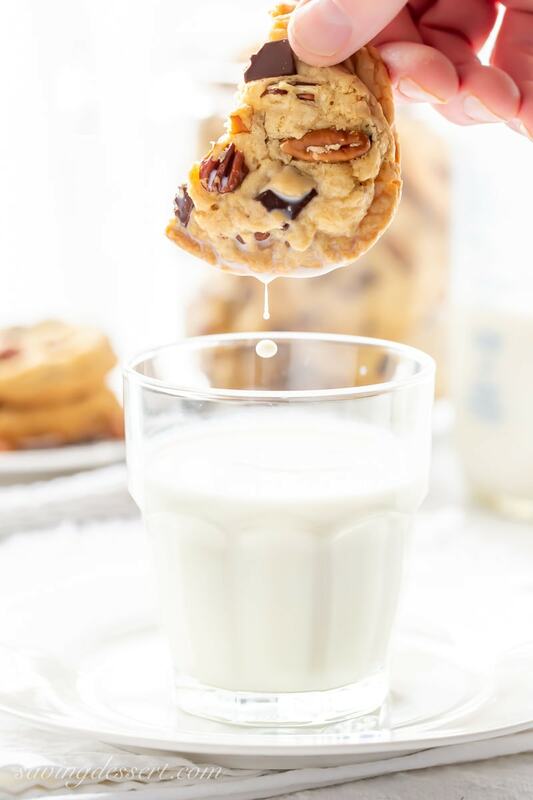 These cookies are perfect for dunking and won’t fall apart in the milk! Grab a glass and enjoy. With a capacity of 2 tablespoons, this durable stainless steel cookie scoop is great for making jumbo sized cookies as well and scooping batter for cupcakes. Don’t forget you can also use this scoop for dipping ice cream! Deliciously thick and chewy cookies like those you might find in a fine patisserie! Place pecans on a small baking sheet and bake for about 5-8 minutes or until lightly toasted. Remove from the oven to cool while preparing the cookie dough. In a medium mixing bowl combine the flour, baking soda and salt. Set aside. In the bowl of a stand mixer fitted with the paddle attachment, beat the melted butter, brown sugar and granulated sugar on medium until smooth and lightened. Add the egg, egg yolk and vanilla. Blend on medium speed until combined. Reduce the speed to low and add the flour mixture in 2 additions, blending just until the flour disappears. 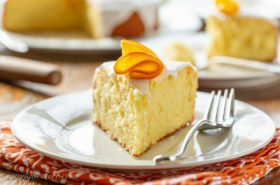 Scrape down the sides and bottom of the mixing bowl with a rubber spatula, and mix again and well combined. Add the nuts and chocolate chunks and stir with a wooden spoon until combined. Store in an airtight container at room temperature. If storing for more than one day, add a slice of sandwich bread to help the cookies stay soft and chewy. Looking for more delicious cookie recipes? Check out these White Chocolate Macadamia Nut Cookies with Coconut. They’re also a delicious jumbo sized thick and chewy cookie loaded with plenty of coconut and crispy nuts. Click HERE to get the recipe for White Chocolate Macadamia Nut Cookies with Coconut. Another recent favorite are our Chocolate Chunk Shortbread Cookies made with just a few quality pantry ingredients. These never fail Salted Chocolate Chunk Shortbread Cookies are easy to whip up and freeze well too! Click HERE to get the recipe for Chocolate Chunk Shortbread Cookies. 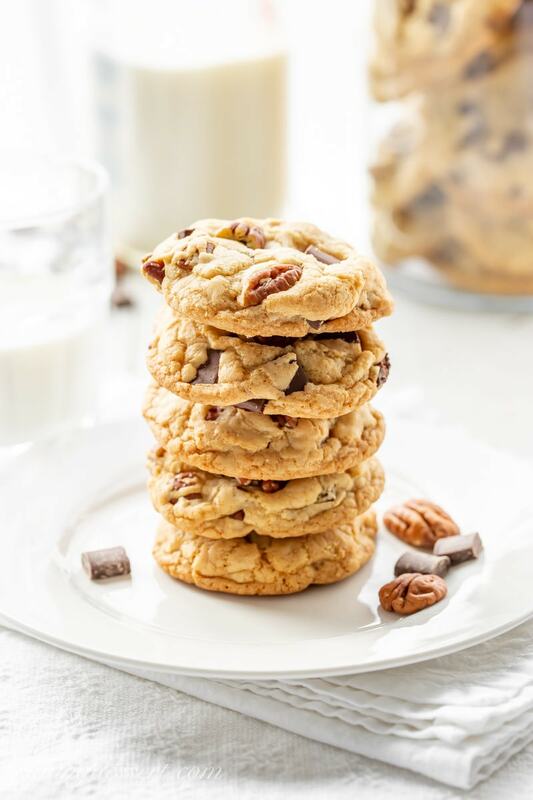 And finally, don’t miss these thick and chewy Chocolate Chocolate-Chip Walnut Cookies with crispy edges, a soft almost brownie-like middle, and big chunks of walnuts. Click HERE to get the recipe for Chocolate Chocolate-Chip Walnut Cookies. Ooh, I think I found a new favorite, too!! I’d have to leave out the pecans for Bill, but thick and chewy is just how we like them!!! I have never met a chocolate chip cookie I didn’t like! Guess I’ll add these to the list! Pinned! Me too – thanks Abbe! Yup, more chocolate chunk cookie recipes is definitely better. I believe mathematically, for formula for the proper amount is n + 1. 🙂 Anyway, these look most excellent — my kind of cookie. Thanks! I love a chewy cookie as well. 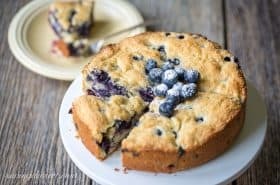 Wish I could have one right now but I’ve pinned the recipe and hopefully can have one as soon as I’ve been to the market 🙂 Thanks for sharing. Your cookies look amazing, Tricia! I love chocolate chippers with pecans! I am always looking for a new chocolate chip cookie recipe. Thanks for sharing Tricia, your photos are stunning. Pinned! Great cookies, Tricia! 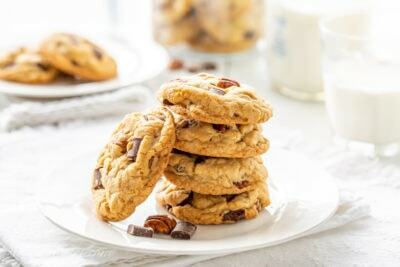 Chocolate chip cookies are a favorite here and I love these with all the pecans, and being chewy makes them even better. I’ll take a dozen, please! 😊 Thanks for the great recipe! Is there anything better than a chocolate chip cookie? 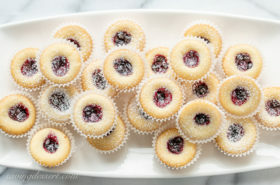 These look so chewy and delicious – definitely have to try your recipe! Pinning, so the next time the CCC urge emerges, I’ll be ready! These look super good and since mom’s chocolate chip cookies were chew rather than crisp, I still prefer them that way – I would love these. Hope you give them a try Larry – so good! I used to love crisp cookies more than the chewy one, but now I find soft big chewy cookies so much more satisfying and delicious. These look fantastic, Tricia. Me too Angie. Thanks so much!